Apologetics Press - Water on Mars? What's the Significance to the Creationist of Finding Water on Mars? If naturalistic evolution were true, it would be inconceivable that extra-terrestrial life would not exist. So evolutionists are seemingly frantic in their search for such life. In September of 2013, the journal Science reported results from the Mars rover Curiosity’s exploration of the planet (Grotzinger, 2013). Fascinatingly, water was found in the Martian soil. What does this mean for creationists? Does it prove evolution? NOVA, funded by the National Science Foundation, said in 2005, “If life is common, then we should be able to find signs of it beyond our own little planet. Unfortunately, the evidence has been elusive” (“Ingredients for Life”). Life has not been discovered anywhere in the Universe apart from Earth, but evolutionary scientists have long hoped at least to find indirect evidences of currently or previously existing life, even if they cannot find life itself (cf. Miller, 2012). The most important requirement for life is liquid water, and that’s the defining requirement for life in terms of our solar system. There’s plenty of energy. There’s plenty of carbon. There’s plenty of other elements on all the planets in our solar system. What’s rare, and which, as far as we know, only occurs now on Earth is liquid water (“Ingredients for Life”). While one of Jupiter’s moons (Europa) is already known to be covered with ice, a key ingredient for life is liquid water. It seems that now there is evidence that liquid water does exist in space. Soil tests taken from the Curiosity rover indicate that Mars’ soil has 2% water by weight (Landau, 2013). To evolutionists, this is a significant find, since it eliminates one of the barriers preventing evolution from being true. According to NOVA, “Mars might be too cold and dry to harbor life today, but if water was once there, then perhaps life was too” (2005). Curiosity is not capable of detecting life directly; it wouldn’t confirm either modern life or ancient fossil organisms. It can, however, determine if the ancient environment was habitable—which the rover told us it was—and look for organic compounds. Finding those compounds wouldn’t prove the existence of life, either, because they can come from other sources. But the appearance of organic molecules would suggest that the environment is good at preserving them…. [S]o far, Curiosity has not directly detected organics in the soil (Landau, emp. added). So nothing has been proven concerning extra-terrestrial life by the rover study. Once again, speculation and wishful thinking still rule the day for evolutionists. Scientists are still trying to figure out if life could exist in outer space—much less that it does or did. Bottom line: while finding liquid water may mark off one of the barriers facing evolution, it is not positive proof of life. It’s just one more step towards the starting line—not the finish line. In reality, evolution still isn’t even in the race with creation. Grotzinger, John P. (2013), “Analysis of Surface Materials by the Curiosity Mars Rover,” Science, 341:1475. “Ingredients for Life” (2005), NOVA, December 17, http://www.pbs.org/wgbh/nova/education/evolution/ingredient-life-water.html. 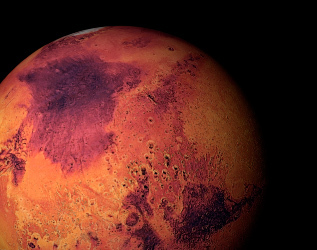 Landau, Elizabeth (2013), “Water Discovered in Martian Soil,” CNN Tech, October 7, http://www.cnn.com/2013/09/30/tech/innovation/mars-water/. Miller, Jeff (2012), “Space: The Womb of Life?” Reason & Revelation, 32:62-64, http://apologeticspress.org/pub_rar/32_6/1206_V01.pdf.